ICES approached the Taliesin Preservation Commission – formed to oversee the preservation of Taliesin, the estate of Frank Lloyd Wright – suggesting the need for landscape preservation. As America’s foremost architect, the many buildings comprising the estate are the focus of the commission. However, Mr. Wright actively shaped the landscape revealinng his skill as a Landscape Architect: he was in correspondence with one of the pre-eminent Landscape Architects of the day, Jens Jensen. 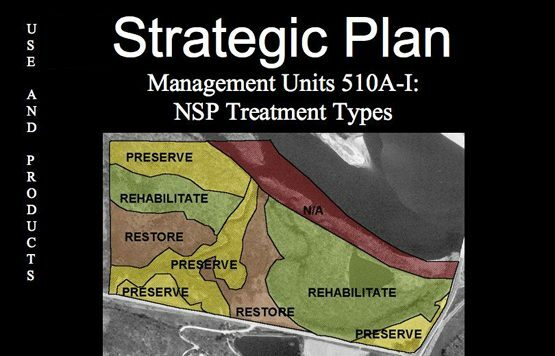 ICES obtained a grant to develop a Strategic Plan for the restoration of this historically significant landscape, and subsequently another grant to fund management. 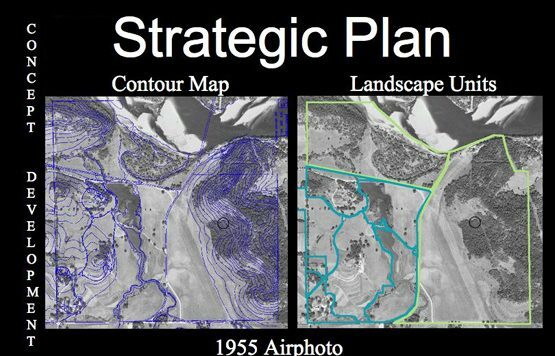 A GIS application was created in order to rectify and overlay various aerial photographs and contour maps to allow a thorough investigation of landscape change since Mr. Wright’s death. Attendent Botanical Inventories revealed numerous state-listed plant species of conservation concern, and nearly a quarter of the state’s flora. Animals designated as being Species of Greatest Conservation Need were also identified. However, in this application, establishing historic conditions was the focus of the grant; informing preservation and restoration activities. 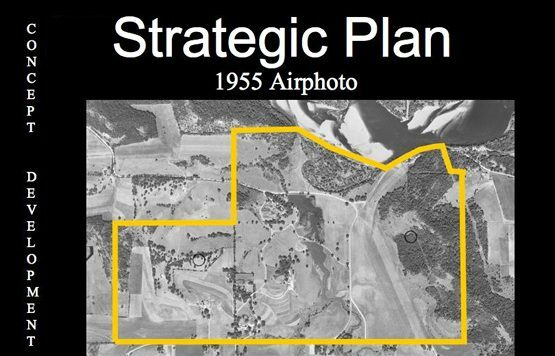 A historic aerial photograph from 1955 was used to used as a base map to establish vegetative patterns during the Period Of Historic Significance – the later years of Mr. Wright’s life when he had most fully articulated his vision of this landscape. 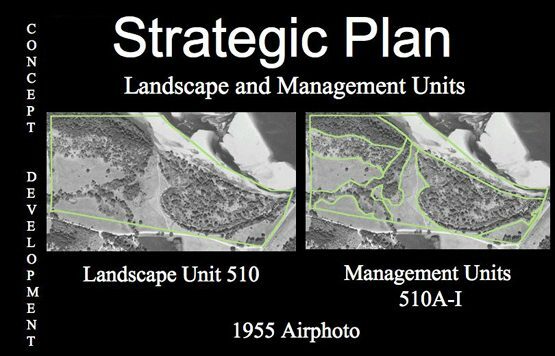 Management Units were derived by delineating distinct land use and vegetative cover types using the 1955 aerial photograph. This aerail photograph was geo-referenced to orthophotagraphy, and the management units overlain on this 1995 aerial photograph to establish the dramatic changes that had occurred since 1955. 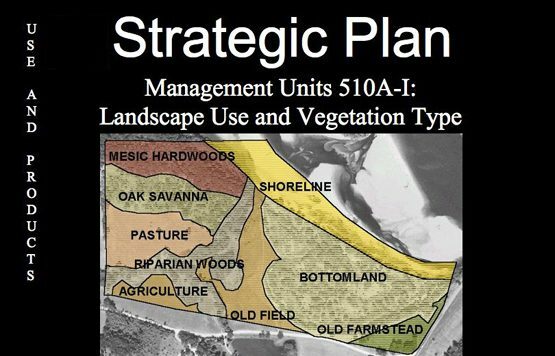 Changes that could feasibly be restored – agricultural and vegetative patterns – were distinguished from those that could not be, e.g. 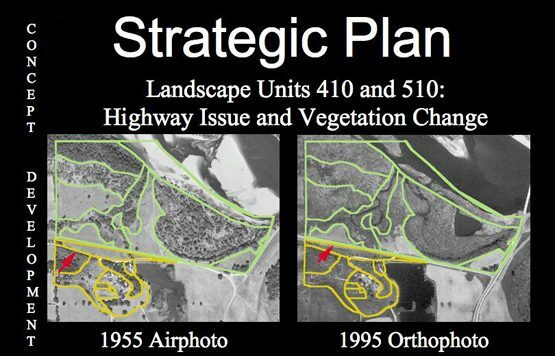 the altered course of the county highway as depicted below in excerpts from a PowerPoint presentation, created from the GIS application, to articulate a Strategic Plan to restore this landscape. Other components of this multi-faceted research are illustrated under Tree Inventories and Woodland and Savanna Restoration.